Every culture has ghost stories, and scary urban legends. Scary urban legends and ghost stories can shed a lot of light on the culture of the place and the people where the story is based. This is the sixth in a series of articles based on Japanese Scary Stories. This is the story of the Gashadokuro: The Starving Skeleton. Yuki and his friends just finished their racing practice, and were making their way toward the station. It was almost 9:00 on a cold early winter’s night. “Let’s cut through this way, its a short cut to the train station.” He said to his friends. 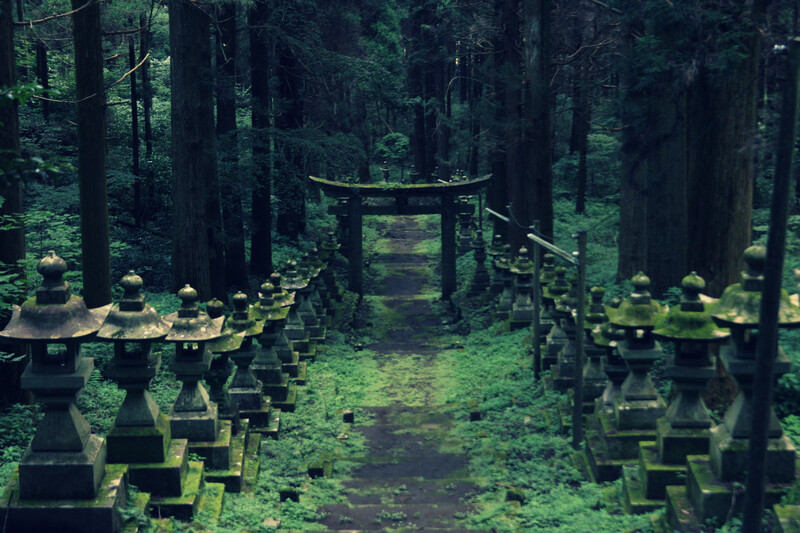 “No way,” his buddy Masashi said, “that old forest is really creepy. There was a battle there a log time ago, my grandpa says it is haunted”. All the boys continued to laugh. Masashi, face red as a beat, simply looked at the ground and said, “I’m not going in there.” He turned around and walked away. As they made their way down the old forest path, using their smartphones as flashlights in the pitch black, Yuki felt something odd. He heard and felt a high pitch ringing in his ears. He opened and closed his mouth, figuring it was just some sort of pressure differential, or something. He looked around and saw his 3 friends doing the same thing. Suddenly an ear piercing cry struck him like a truck, freezing all of them in place. As if out of nowhere a giant hand burst out of the forest grabbing the friend on Yuki’s left. His friend screamed a scream of pure terror, as the hand-picked him up, above the tree line. Yuki watched as the pale white hand moved up, and up, and up! Out of the darkness, a shape formed. It was massive, at least 25 meters tall, and it was a skeleton. A giant skeleton! The skeleton brought his friend to its horrid maw, and bit off his head. It opened up its mouth and drank the blood geysering out of his friend. As if released from a spell, Yuki felt control of his legs and ran. His other friend close in tow. He felt the giant creature in pursuit behind them. He heard his other remaining friend scream. He risked a glance back, only to see his friend being listed up. He turned around and continued to run for all he was worth. He heard his friends screams cut off like a radio with the plug pulled. He finally made it out of the forest. He saw the train station ahead of him. “Just a little further,” he thought. He took a step forward, and fell. He looked back. He saw a bony finger lazily holding his food to the ground. It picked him up by his leg, holding him up between thumb and forefinger. It listed him up high into the air above its head. It tilted its head back, opened its pearly white dead teeth, and let go. 3 most popular Japanese girl models! The oldest and most historical Onsen in Japan!